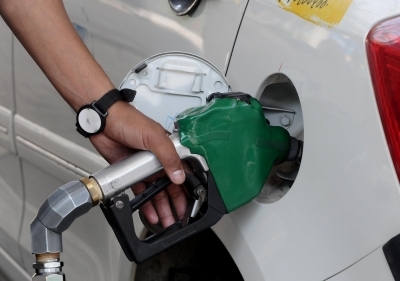 New Delhi Sep 16 (IANS) The rise in domestic fuel prices continued unabated on Sunday with the price of petrol nearing the psychological Rs 90 a litre mark in Mumbai and the fuel selling at Rs 89.29 under the dynamic pricing regime. As per rates released daily by state-run Indian Oil Corp the depreciating rupee and expensive crude oil further pushed petrol and diesel to new record highs on Sunday. Petrol in Delhi which is cheapest among the four metros due to lower taxes rose to Rs 81.91 per litre on Sunday while it increased in Kolkata and Chennai to Rs 83.76 and Rs 85.15 respectively. Similarly diesel prices rose on Sunday in Delhi and Kolkata to Rs 73.72 and Rs 75.57 per litre respectively and climbed to Rs 77.94 and Rs 78.26 per litre in Chennai and Mumbai respectively. Fuel prices in the country have been going up almost daily since August 1. They fell only once on August 13 and have been on record levels for nearly two weeks now. Inflationary risks along with broadly negative global cues depressed the Indian rupee to a new low of 72.74 on Tuesday. Also high global crude oil cost has become a major concern for the country which imports over 80 per cent of its oil requirements. The UK Brent crude oil price hovers around $78 per barrel. Since the start of the calendar year the petrol price in Delhi has gone up by 15.4 per cent from Rs 69.97 on January 1 2018. The hike in diesel price has been even more steep. It has gone up by 22 per cent since January 1 when it cost Rs 59.70. Earlier this week the West Bengal government reduced the excise on petrol and diesel by Re 1 per litre each. As per the country s pricing mechanism the domestic fuel prices depend upon the international fuel prices on a 15-day average and the value of the rupee.